Glasgow, a city where tradition meets contemporary. Glasgow is hailed as the ‘dear green place’ for its many beautiful parks, however its aesthetic standing truly rests with its breathtaking architecture. It is a city where Italianate steeples and medieval spires sit harmoniously with neo-gothic towers, sensuous Charles Rennie Mackintosh Art Nouveau and the titanium and glass of the contemporary city. Glasgow has the full spectrum of architectural styles, from the modern design of the state-of-the-art Glasgow Science Centre, to the intricacy of Glasgow Cathedral, one of Scotland’s most magnificent medieval buildings. View the sandstone Baroque splendour of Kelvingrove Art Gallery and Museum, and nearby savour the unmistakable lines and palettes of Charles Rennie Mackintosh, one of the most creative figures of the early 20thCentury. A world-renowned architect, designer and artist, Mackintosh’s works can be experienced throughout the city including his masterpiece The Glasgow School of Art, which attracts talented students from all over the world. To easily appreciate the creative genius of Charles Rennie Mackintosh, enjoy a compact itinerary with conveniently short transfer times between places of interest. Start with a visit to House for an Art Lover on the south side of Glasgow, a unique attraction inspired from Mackintosh’s portfolio of drawings of 1901 which includes a permanent exhibition of decoratively furnished rooms. 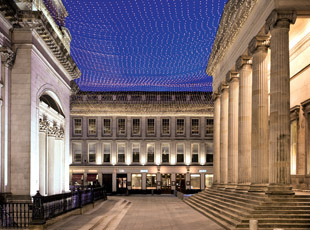 Head to the city centre for sumptuous afternoon tea at The Willow Tearooms in Buchanan Street, followed by a visit to The Glasgow School of Art, one of the most influential structures of the twentieth century. Many examples of Glasgow’s outstanding and varied architecture, including beautiful panoramas of the city when crossing the River Clyde. A visit to nearby Scotland Street School, an outstanding example of Mackintosh’s design work that presents the history of education in Scotland.